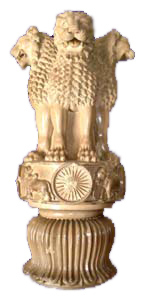 The lion capital, India’s national emblem is exhibited in this gallery or main hall. It is made of Chunar sandstone measuring 2.31mtr. in height. Its characteristic Mauryan polish makes it unique. Earlier, it was crowning the Asokan pillar erected at the deer park. To it’s left stands a colossal Bodhisattva image of red sandstone, which was donated in 3rd reignal year (81 C.E.) of Kushana king Kanishka by friar Bala of Mathura. The figure bears inscriptions in Kushana Brahmi script at pedestal and on back in support of its erection. The image was dedicated under the shade of a huge umbrella fixed on an octagonal shaft standing just behind. Umbrella carved with auspicious symbols is kept towards north east of the main hall. 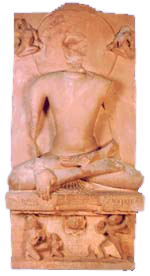 To the left of this figure, there is another Bodhisattva figure made of locally available Chunar sandstone. To the east & south east of the gallery, there are eight standing Buddha figures carved in classical Gupta characteristics. In most of the figures, right hand is in abhay mudra (protection giving attitude) while only one figure is in bhumisparsha mudra (earth touching attitude). Some of these figures bear donative inscriptions in Gupta Brahmi script. 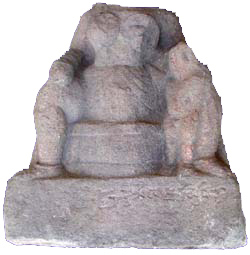 The other important figure is that of standing Tara with both arms broken. She is putting a lower garment and is richly adorned with ornaments. 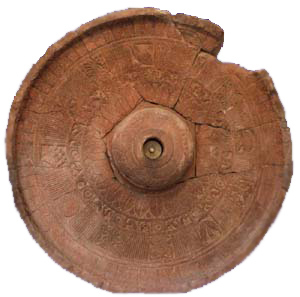 There is a significant fragment of an umbrella kept in a showcase towards right side of the entrance which is carved with an inscription of Kushana period mentioning the four noble truths of Buddha's first sermon at deer park i.e. sorrow, origin of sorrow, cessation of sorrow and the way leading to the cessation of sorrow. Some stupa railings and coping stones of 2nd cent. B.C.E. are also displayed in the main hall. Early Medieval, 10th- 11th cent. C.E. Gupta, 4th- 5th cent. C.E. Kushana c. 1st cent. C.E. Late Kushana, c. 2nd cent. C.E.